A World War II vet from Hatboro has died at the age of 108. HATBORO, Pa. (WPVI) -- A World War II veteran from Montgomery County who met President Barack Obama last month at the White House has died. He was 108-years-old. Sgt. Bill Mohr, the oldest resident of Hatboro, passed away on Sunday. Action News is told Mohr died with a smile in his heart, surrounded by his loving family, his caregivers, an Irish priest from his family's hometown and Santa, who visited him at the hospital during his final hours. 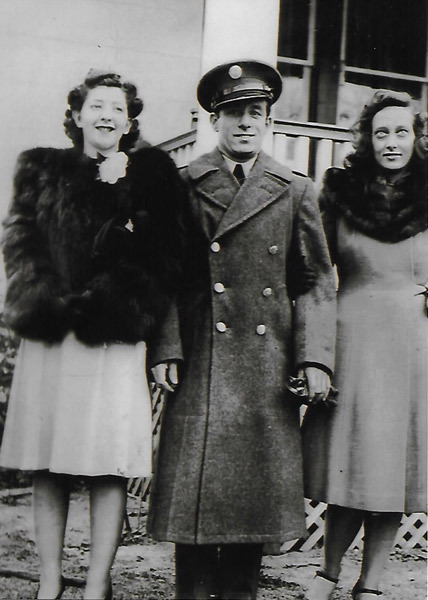 Mohr was born in Philadelphia on October 22, 1908 to Louise and William Mohr and was preceded in death by his twin brother Joseph, his sister Mildred and his half-sister Louise. He married Josephine (Josie) DeCarlo on July 31, 1943. Josephine died in 2015 at the age of 98. They were married for 72 years. Bill and Josie Mohr at Bill's 104th birthday. In 1940, Mohr enlisted in the Army where he attained the rank of sergeant. He was a member of the 381st Replacement Company European Front, 45th Infantry from 1943-1945. Mohr served in North Africa, Italy, France and Germany. He was awarded the Legion of Honor, Chavelier, by the French government for his service in the Invasion of St. Tropez in August of 1945. He participated in the invasions of Anzio and Salerno in Italy. Mohr's unit also marched up the Rhine River Valley and helped liberate the Dachau Concentration Camp. Mohr was honorably discharged from the Army in 1946. He and his wife Josie settled in Hatboro after the war in a home that Bill built. They had four children, William T., Joanne (Jodie), Gary and Richard (Rick). In addition, they had two grandchildren, Christopher and Connor Mohr; three step-grandchildren, Jim, Suzanne and Scott Hartshorne; one great-grandchild and two great-great grandchildren. Mohr and twin brother Joe owned a landscaping business in Hatboro called Mohr Brothers' Nursery. When Mohr was 63-years-old, he went to work for Pressure Products as a lathe operator and worked on cutting expensive pieces of metal. His work was used on nuclear submarines and in power plants around the world. He worked full time until he was 93-years-old and drove a car until he was 97-years-old. On November 11, 2016, Mohr made national headlines when he was invited to be a guest at the 2016 Veterans Day Breakfast at the White House. When the president asked Mohr for the secret to his longevity, Mohr responded that he eats Campbell's Chicken Noodle Soup every day. The president laughed and also expressed his love of Campbell's soup. Meeting a sitting President was the fulfillment of a lifelong dream for our father, who was a true patriot. We would like to thank all the veterans who supported my dad in his final days. Greatest thanks go to his team of caregivers who would never leave his side. They made his life and his final days so joyful. His daughter Jodie added, "My dad was an inspiration to all who knew him. A few moments in his presence would melt your heart. Always a smile; always a kind word."